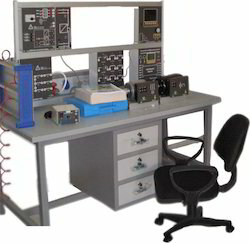 Electrical Engineering Equipments are sought for all engineering related operations. They have wide range of applications and simplify the complexities to great extent. These equipment are offered at market leading rates. 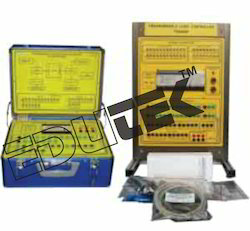 Edutek Instrumentation are offering a wide range of Engineering Training Equipment for Technical School Colleges and Universities World wide. 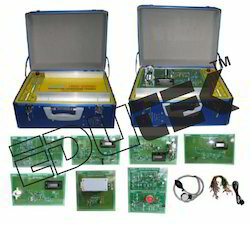 Edutek are manufacturer and Exporter of Educational trainer equipment .Electricity And Electronic Fundamental Trainer, Component And Circuit Based Pcb Modules. Electricity and Electronics Fundamentals Trainer covering the concepts, theoryand applications of basic electricity and electronics that are required for technicians. This comprehensive course is presented in a systematic way startingthe student out at the beginning covering basic theory and measurements withmeters. A. Base Station:Student Base Station: This unit serves as the platform for carrying out the student experiments. Experiment modules areinserted into the base station and interconnected to the services provided by the base station through 2 mm sockets and testleads. The base station provides for all the primary needs of the experiment modules, and includes a variety of componentssuch as the following:1. Fixed regulated DC Power Supplies: +5V, +15V, -15V2. Variable Regulated DC Power Supply 0 - 25V3. Potentiometers: 4 units4. Pulse Switches: 2 units5. 8 bits LED display.6. Toggle Switches: 5 spdt7. Speaker: 2.25 inch, 8 ohm/0.25w8. One set of 2 mm stackable test leads to perform all required inter-connections.B. Set of PCB Board Experiment Modules: The trainer comes with a complete set of experimental board modules that closelyfollows the courseware. Each module consists of a high quality epoxy coated fiber glass printed circuit board with theelectronic components mounted on to the surface. Each board is printed with a clearly laid out silk screened schematic circuit orcomponent diagram. The experiment boards are designed to be very educational and to reinforce the link between thetheoretical and practical aspects. All the components and connections (PCB tracks) in each circuit are clearly visible and can beassociated with the schematic diagram, nothing is hidden from view. A self contained teaching module, ideal for class and project work. Allow realistic studies of short. Medium and long distance transmission lines under variable load and power factor conditions,as well as with inserted faults. Fault application switch and earth fault resistors allow studies of earth fault currents and the operation of relays of varying sensitivity. Enables “pi” and “tee” methods. Built in industrial-standard digital protection relay gives wide range of functions. 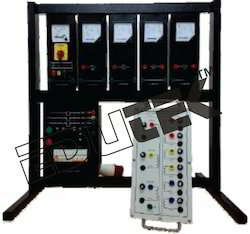 Three phase lines five sections module mimic 125 km kv and 100 mva line 132,the module rated voltage is 380 va.
We are manufacturer and Exporter of Electrical Engineering tyraining Equipment for engineering colleges. Laboratory experiments that serve the items listed. Power supply with at least fixed 3 phase 380 vac, fixed 220 v dc and variable.0-380 v. three phase and 0-230 v dc,5 a. the power supply must contain a center taped transformer. All power electronics components piv and 5 a.
Self-contained teaching module ideal for class and project work . Allow investigations of radial and ring-main distribution circuits. Able to examines distribution efficiency, voltage drop and voltage regulation. Shows effect of line on losses and efficiency. Built in industrial standard digital protection relays give wide range of functions. Includes supplies circuits protection,(internal variable(r,l, and c loads instruments and controls. 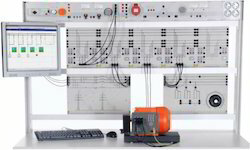 The system simulate a distribution system 380 v,60 hz,2 kva and can be operated as a redial and ring system with tapped transformer and var compensation and verify experiments given in the notes column. OC SC TEST FOR THREE PHASE TRANSFORMER WITH PANNEL AND TRANSFORMER WITH DIGITAL PANEL METER DISPLAY. The Distribution Transformer Trainer, Model 8361, is a portable, hands-on trainer designed to allow students to develop competence in completing single/three-phase transformer connections similar to those performed in the North American power distribution system. The trainer contains two sets of three single-phase transformers to demonstrate three-phase banking configurations, such as wye-wye, delta-delta, closed delta-wye, closed wye-delta, open-wye, open-delta, and others. Each individual transformer winding is protected by a thermally-activated circuit breaker and designed to accept multiple faults. 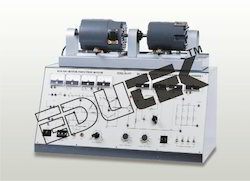 The trainer is faultable in order to develop sound techniques for troubleshooting single-phase and threephase transformer banks. Eight (8) trainer faults are available. The trainer is complete with a student laboratory manual written in a skill-building, performance-based format, allowing easy set-up of all laboratory exercises. Didactic case for the study of foundry fundamentals. Operations of ramming up of the moulding sand, melting of the metal, pouring, forming and fettling can be performed step by step. 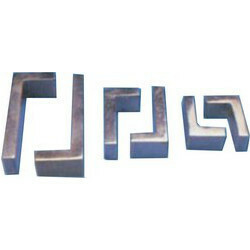 Practice of melting, unmelting and foundry with irregular and asymmetrical patterns. Making up a casting with cavity (pipe reduction). Aluminum cope and drag box, screwable. 2 Kg. metal alloy (melting point 70°C approx.) and 6 Kg. moulding sand in a separate container. 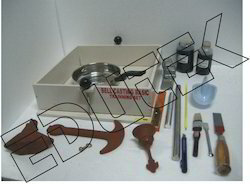 All instruction set is supplied ready to use, including enough test material. Dimensions: 600 x 400 x 200 mm. approx. 1.- Study of foundry fundamentals. 2.- To manufacture of a pipe-reducing flange with cavity of 1 kg-mass approx. 3.- Practice of melting, unmelting and foundry with irregular and asymmetrical patterns. 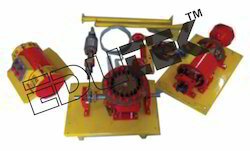 This unit is designed for production of hollow bodies in a fast rotating die. This unit is mounted on a 2mm thick steel sheet, primed and painted, and hold by a frame of extruded and anodized aluminum, which provides a great stiffness and resistance. Three-phase motor that does 1.67A with 2700 rpm. A variator that controls the motor. It can turn with a maximum frequency of 50Hz (which corresponds to 3000rpm approximately) and a minimum one of 10Hz. The motor turning speed can be changed from this variator. Turning anticlockwise direction. Stainless steel cast axis with a diameter of 20 mm. The cast is cylindrical and is made of aluminum, outer diameter of 82 mm, inner diameter of 70 mm and length of 150 mm. The cast useless length is 110mm, once the lids have been placed. The cast is made with a little cone-shape to make easier the extraction of piece towards the inlet side. A small saucepan in which the tin can be heated. A crucible from which the tin can be pour in order to the start the experiment. 2.- Production of hollow bodies in a fast rotating die. 3.- Centrifugal casting with different turn speeds. 4.- Centrifugal casting with different temperatures of tin. 5.- Centrifugal casting for different amounts of tin. Introduction to sand casting: student experiments with 3 different patterns (bell, anvil and anchor). The student will practice in first place with symmetrical pieces and after this with asymmetrical ones. The bell as a natural or an one-piece pattern. The Anvil as a split, asymmetrical pattern demonstrates the shrinkage cavitation. The Anchor, as a split, symmetrical pattern. Small downgate and big downgate. 2 Kg. metal alloy (melting point 200°C approx.) and 6 Kg. moulding sand in a separate container. 2.- Introduction to sand casting: student experiments with 3 different patterns (bell, anvil and anchor). 3.- The bell as a natural or a one-piece pattern. 4.- The Anvil as a split, asymmetrical pattern, demonstrate the shrinkage cavitation. 5.- The Anchor, as a split, symmetrical pattern. Motor and Generator/Alternator mounted into a special frame to accommodate coupling and electrical connections. All wiring connections from machine windings are brought out to 4mm terminals. Connection leads with banana plugs facilitate quick and easy connections between the Motor-Generator System and other controls. 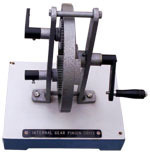 A fault insertion for machine winding is available as an optional item for student trouble shooting exercises. Power supply: 220/380 VAC, 3A. Power Indicator : indicate the incoming power at L1/R, L2/Y, L3/B. Power Control : Start Button, Stop Button, Emergency Button. Lamp Indicator : indicate run, overload and emergency condition on Instrument panel. Circuit Breaker : ELCB (Earth Leakage Circuit Breaker), MCB (Miniature Circuit Breaker). AC Voltmeter : Used to measure AC voltage. Motor Switch : used to connect-disconnect the motor with the power supply. Generator Switch : used to connect-disconnect the generator output to load. (%), Variable DC power supply (3 to 180VDC). 1 Set of test leads. 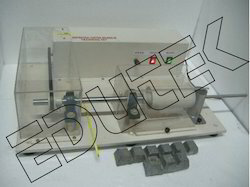 Base plate machine bed with anti vibration rubber feet (bench top type) and protective cover. 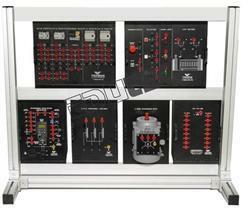 The modules feature real industrial components that easily and securely fit into the training panel frames. , Special powdercoated aluminum rails for plexiglass panels, which gives secure and firm fitting modules. Panels must be quickly arranged toconduct many experiments. All electrical connections for each component are brought out to 4mm color-coded heavy-dutybinding posts. Wiring from the component to the terminals is also color-coded. Interconnections between the panels andcomponents are made via 4mm stackable test leads. Stackable test leads allow multiple connections from a single point,which is very useful when taking electrical measurements. Therefore the student is able to relate the circuit theory with thepractical aspects of the real component and actual wiring connections.The trainer will include:Residential Switches:Mounted on Plexiglass panel with 4mm terminals- Switch, Surface mount, 1 way, 2 terminal, 10A, 1 gang, (4 modules)- Switch, Surface mount, 2 way, 3 terminal, 10A, 1 gang, (4 modules)- Switch, Surface mount, 2 way, 4 terminal, 10A, 1 gang, (4 modules)- Switch, Surface mount, Intermediate, 10A, 1 gang, (4 modules)- Switch, Surface mount,1 way, 2 terminal, 10A, 2 gang, (2 modules)- Surface mount, 2 way, 3 terminal, 10A, 2 gang (2 modules)- Switch, Surface mount, 2 way, 4 terminal, 10A, 2gang (2 modules)- Switch, Surface mount, marked "Bell" (2 modules)- Switch, Surface mount, illuminated (2 modules)- Switch, Surface mount, dimmer (2 modules)- Bell/Door opener push button: 2 SPST switches 250Vac, 10A (1 module)Sockets Sets:To include the sockets mounted onto panel with 4mm terminals, each socket is to include a matching plug- 1 Phase Socket with switch, 13A, 3 prong, 1 gang (3 modules)- 1 Phase Socket with switch, 13A, 2 prong, 1 gang (2 modules)- 1 Phase Socket, with switch, 16A, 1 gang (5 modules)- 1 Phase Industrial Socket, with cover, 16A, 2 Pole & Earth (2 modules)- 3 Phase Industrial Socket, with cover, 16A, 2 Pole with neutral & Earth (2 modules). 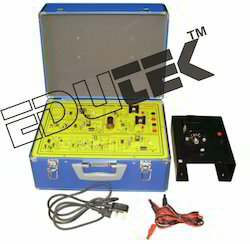 The Electrical Machine Trainer is designed to provide the students with agood and strong foundation in electrical machine technology. 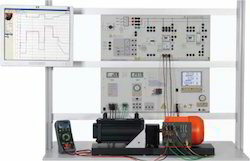 Thetrainer consists of modules and panels containing meters, variableresistors, resistive load, capacitive load, inductive load, motors,generators, and other supporting equipment which are suitable to studyvarious types of motors and generators according to theircharacteristics. The study of motors and generators covers the theory,design and characteristic of each motor and generator. Prime Mover & Torque Measurement. DC Motor Construction, DC Generator Construction. Series Motor Characteristic (starting, running, under load). DC Compound Motor Characteristic (starting, running, under load). Split-Phase Induction Motor Characteristic (starting, running, under load). Capacitor-Start and Run Motor Characteristic (starting, running, under load). Universal Motor Characteristic (starting, running, under load). Wound-Rotor Induction Motor Characteristic (starting, running, under load). Squirrel-Cage Induction Motor Characteristic (starting, running, under load). Synchronous Motor Characteristic (starting, running, under load). This trainer is provide a comprehensive course on Solid State Relays and their applications. Solid State Relays are typically used as the modern replacement to conventional electromagnetic relays. Solid State Relays generally provide more flexibility in their control applications and easily combine low voltage and high voltage circuits working in conjunction with each other. This trainer also provides a good introduction to semiconductor applications and theory. The trainer features three low voltage circuits which controls the solid State Relay that in turn controls a higher voltage circuit. The low voltage circuits include a touch operated switch circuit, a sound operated switch circuit and an optical photo relay switch. A mode selection switch is used to determine which low voltage circuit will control the SSR. The SSR will then be turned off or on by this circuit. 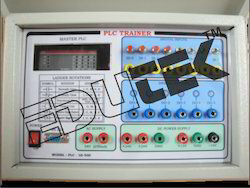 The trainer has designed to work with most equipment that can becontrolled by PLCS. It specifically work with the PLC trainers provided in this package. The system consists of a base station which provides a platform for themodules. 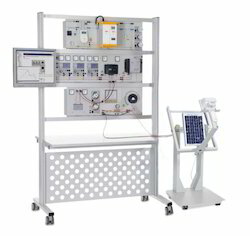 The base station includes a number of switches, power supply and other control and signaling devices that can be used in conjunction with the modules for control, signaling or modification purposes. It features graphic representations of the device that they are simulating and use LED's to illustrate the actions that are taking place. The modules range from basic to intermediate levels in complexity. It provides practical programming applications for the student to workon and apply his new knowledge about PLC operations. 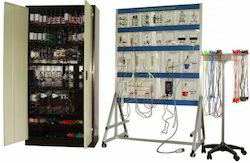 These modular application modules allows immediate and easy use of PLC programming techniques and also the student may perform debugging procedures after watching the program run and correction errors. The base station provides a platform and general facilities which the modules require for operation. modules via 2mm stacking interconnect cables that are also included. variables to the operation so that different characteristics could be explored. b.Vehicle Parking Module Objective: After completing this experiment, the students are expected to understand of using DIFU,DEC, CMP, and MOVE instructions in the Vehicle Parking operation programming application. c. Elevator Lift Module Objective: After completing this experiment, the students are expected to understand of using SET, KEEP, SBS, TIM, SBNand RSET instructions in the Elevator Lift operation programming application. d. Laundry Module Objective: After completing this experiment, the students are expected to understand of using KEEP, SET, TIM, DIFU, CNTand RSET instructions in the Laundry operation programming application. g. Packing Module Objective: After completing this experiment, the students are expected to understand of using CNT instruction in the Packing system Operation programming application.h. Tank Level and Pump Control Module Objective: After completing this experiment, the students are expected to understand of using DIFU and TIM instruction inthe Tank Level and Pump Control Operation programming applicationi. Alarm System Module Objective: After completing this experiment, the students are expected to understand of using TIM and KEEP instruction inthe Alarm System Operation programming application. The PIC programmer set has designed as a tool to allow Students and developers to program PIC Micro-controllers. It should be a powerful and flexible system that provides a user friendly environment to carry out a large variety of programming application tasks. The programmer should come complete with the development programming board and Programming Software.The PIC programmer should be used for downloading a specific program for controlling the experiment modules such as, temperature control, speed control and traffic light control.The PIC programmer should uses USB/Serial port connection. The PIC programming software can be updated as new Pics are released.. The Programming software for PCs must work under Windows NT/2000/XP/7. 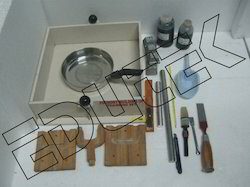 The kit should be suitable for learning PIC design and programming of various PICs. The Programmable Logic Controller is an PLC product which is powerful and flexible systems ideally suited to your specialized needs. The system should be compatible with a variety of accessories and peripheral, thus allowing this versatile system to be easily expandedinto larger systems. The experiments should be chosen to cover the topicsfrom basic familiarization of the PLC up to programming and application. Introduce the PLC hardware, such as: power supply, inputs, outputsand RS 232 communications. The unit should features a larger capacity compact PLC with approx. 40 I/O points. The set should include software for programming via a PC (PC is optional item). 3. To come complete with comprehensive courseware. 2 analog input and 1 analog output extension module. The Sensor and Transducer Trainer is a modular training system which covers the theory, fundamental concepts and applications of sensors and transducers. The trainer should has many experimental modules covering a wide range various type of sensors and transducers including standard signals processing methods, which are required by many applications. The trainer should consists of base station into which a number of experiment modules can be fitted. A variety of modules should be available which extensively covers the topics of sensors and transducer. This should be consists of a set of several boards that covers aspects of specialized electronics circuits that are commonly required for the study of sensors and transducers. Topics and circuits should covered include Digital to Analog conversion,Analog to Digital conversion, Voltage to Frequency Conversion, Frequency to Voltage Conversion, Bridge Circuits, various filter circuits, signal amplifiers, signal conditioning linearization. Controlled temperature device with precision integrated-circuit temperature sensor which can be used to demonstrate aspectsof temperature control as well as provide for a regulated load device for Temperature module. These modules contain a variety of units that are common to the measurement of air flow. Consist of Differential Pressure Module and Paddle Wheel type Flow meter Module. The modules cover the principles in the reception of sound waves and their signal processes. Consist of Condenser Microphone and Dynamic Microphone. 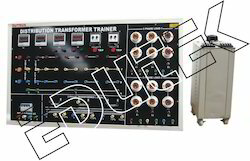 A Single and Three Phase Transformer Experimental Trainer specially designed to help students understand about the various aspects in transformer design and operation such as magnetic fields and circuits, equivalent circuits,phasor diagrams, loss components, load testing and regulation, transformer components etc.A comprehensive experiment manual is provided to guide the students on basic transformer theory and practice, and also provides a practical introduction to power supplies and electrical machines. Series and parallel connection of secondary windings. Magnetic circuits, incorporating the concept of flux, flux density, field. Phasor diagram with transformer on no-load. Equivalent circuit of power transformer. Transformer efficiency using open and short circuit test. Full load test showing temperature rise and efficiency. Voltage regulation using open and short circuit tests. Current transformer Delta and Y connection. A - Base Station: This unit serves as the platform for carrying out student experiments. 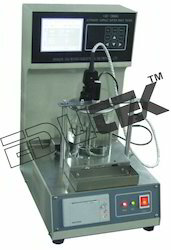 The unit contains two ammeters and two voltmeters which are used to do the voltage and current measurement during the experiments. A clear diagram of a transformer is shown on the base station and is completed with 4mm terminal connections to build transformer circuits.Circuit protection is provided to prevent short circuit and over current conditions. Made of brass alloy heavy duty and polished.